This gemstone will stimulate your mind. Use this natural blue gemstone to learn the value of active listening. It encourages creativity, expression of personal truths and opinions, and promotes good judgement. Lapis Lazuli sparks a desire for knowledge and improves memory. It brings wisdom, honest communication, and a heightened sense of self-awareness. This gemstone recognizes and deflects negative energy like a shield, and reverses ill wishes cast upon you. This empowering gemstone encourages taking charge of life and reveals inner-truth. It promotes communication, enlightenment, and intuition. 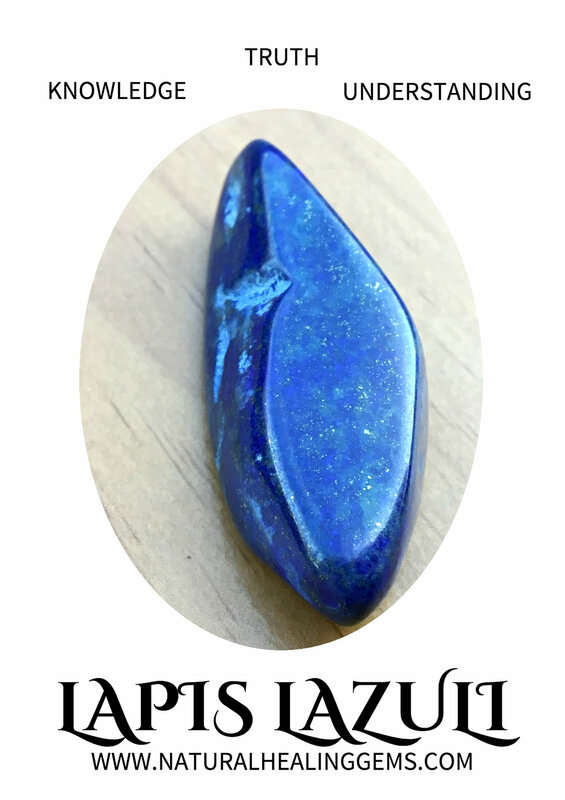 Lapis Lazuli gemstones develop peace, harmony, and balance within the environment. Autism, Cancer, Aids (HIV), Back Pain, Bones, Brain, Childbirth, Dizziness, Epilepsy, Fainting, Hair, Eyes, Headache, Herpes, Immune System, Insomnia, Lungs, Menopause, Migraine, Neurological Issues, Pain, Panic Attacks, Respiratory System, Nervous System, Speech, Seizures, Sinus, Shingles, Throat, Vertigo, and Vomiting.